Rhino News, etc. : Are you sure? Have you checked? Are you sure? Have you checked? Are you checking your designs early and often? There is no reason not to. The simulation and analysis tools for Rhino 5 keep getting better. Scan&Solve™ has always provided finite elements in Rhino without meshing. Now they are offering two additional extensions to their tools. First is SnSMesh. 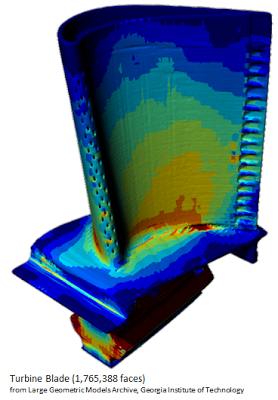 This version of Scan&Solve™ allows users to perform stress simulation on mesh geometry within Rhino. This version has the same functionality as the latest edition of Scan&Solve™ but works directly on closed meshes created in Rhino or imported from other applications that can export .stl, .wrl, .ply, and other mesh formats recognized by Rhino. That means you can directly analyze any part that you can 3D scan. No need to first reverse engineer. Second is SnSScript. This scriptable version of Scan&Solve™ allows users to automate simulation processes that otherwise require user interaction. In the scriptable version, most of the functionality of the original Scan&Solve™ plug-in is exposed for calls from RhinoScript, including simulation setup, simulation computation, and solution visualization and querying.